When we think of shock absorbers, we picture a car on bumpy road, but shock absorbers are all around us. Our own body comes with many versions – from the cushions in our joints to the layers of skin that buffer and protect us from the environment. Everything employs some kind of buffer in response to its environment. Animals have fur, feathers, and scales. Pupils tighten in direct sunlight, skyscrapers are built to flex with the wind (so are trees), and every material on the planet absorbs heat and cools down gradually, so as not to destroy its own structure as external temperature changes. Shock absorbers are critical to a successful life. Being in direct contact with the ups and downs of an external stimulus or environment can be very painful and upsetting. Think a wagon with wooden wheels on a rocky road – bone-jarring. Life is a rocky road for us human beings, presenting us with a continuous stream of big and small challenges, emotions, decisions, and pressures. And while many of these are self-created, they still have to be dealt with. And there are plenty of life events that are beyond our control or hard to see coming. And if we’re not prepared for them, they can cause serious pain and disruption in our lives. When we don’t have enough shock absorbers in place, life can be extremely hard to deal with, unpredictable, and a very bumpy road. Often our reaction to the bumpy road of life is to look for a smoother road. And no doubt there are smoother roads available. Taking fewer risks is a smoother road. Not putting the effort into ‘steering’ in life is a smoother road (at least it seems…). Avoiding discomfort and running from emotions is a smoother road. The problem is that the smoother road is never better. It’s always just delaying pain or transferring it elsewhere. Not dealing with emotions is smoother, yes, but it eventually crushes relationships, keeps businesses struggling, or our health poor. These roads are smoother, but they do not get us to where we want to go. That’s the tradeoff. 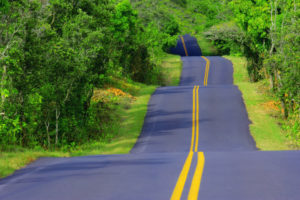 The road to success – the road we all want to be on at our most core level – is bumpy. All other roads are smoother, but they never get us there. So it’ll be a smoother ride for a while, until we realize we never got where we really wanted to go. That’s a big bump at the end. And the list goes on and on. In fact, any list of ‘habits of successful people’ is basically this list – a list of how they build shock absorbers. The most simple example of shock absorbers in life is money. We even use term ‘cushion’ to describe how money can buffer us from life’s bumps. Having a cushion makes a huge difference, and that’s the reason why money is so tightly woven with the term ‘success’. It’s not because the pursuit of money itself indicates success, but instead it’s the recognition that money is a very effective shock absorber. Money is not necessary to live a successful life, but shock absorbers are. Of course other shock absorbers are just as important to success – mental flexibility, positivity, solid physical health, living mindfully, having purpose, self-mastery, and the list goes on. But money tends to be a whole lot easier to obtain than those skills, although you wouldn’t know it from most bank accounts. With a small bank account, as with having low reserves in those other important shock absorbing areas, we take life’s direct impact, feeling every minor bump, upsetting our journey. It’s no wonder so many people feel so bumped and bruised by life – they have no shock absorbers to soften the blow. And in looking for relief they move to a smoother road. With some shock absorbers in place we still experience life’s ups-n-downs, but instead of jarring and disruptive they can actually be smooth and fun. We can even enjoy the downturns – the dips – seeing them as just another part of this sometimes unpredictable road we’re lucky to get to travel. A little more patience, a little more discipline, a little better money management, a little better health, a little more mindfulness, a little more effort, a little more planning…just a little goes a long way in smoothing out life’s bumps. As a wise man once said…’don’t wish it were easier, wish you were better’.